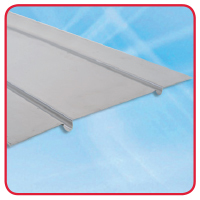 Maincor Heat Emission Plates are for use in timber suspended floors where the joists are at 400mm centres, or in floating floor applications. The plates are 390mm wide x 1m in length. Allow 2.2 plates per m2 of floor area. Scored plates available at 150mm centres. Varying pipe sizes and centres available on request.